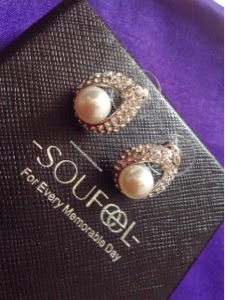 Recently I purchased some sterling silver jewellery which I had been eyeing on for quite some time and finally decided to buy from soufeel.com after checking a lot of reviews on youtube. Sterling silver contains 92% pure silver and looks very elegant. I have a lot of 22k gold jewellery just like every other Indian girl but I don't wear that except for special occasions and family functions due to two main reasons. First is, I don't feel it safe to wear precious gold jewellery because of snatchers roaming freely everywhere in India and second is that most of my dresses especially Indian ethnic wears have silver embroidery on those and gold jewellery does not complement those the way silver jewellery does. 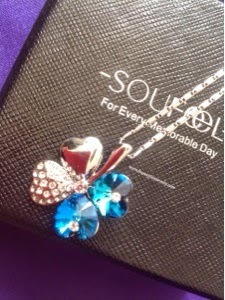 The reason behind choosing soufeel.com was that this brand offers high quality sterling silver jewellery in unique designs at dirt cheap prices. They ship worldwide and offer a free shipping if you order above $50. The shipping is fast because my jewellery items reached me in less than 15 days. All the items were individually wrapped in clear cellophane pouches and packed very securely in a textured black cardboard box. 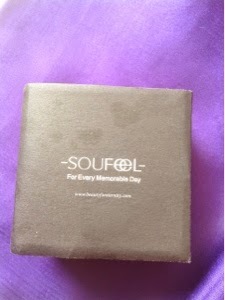 The box had two pieces of sponge and a soft velvety piece of cloth to wipe the jewellery items. I was really impressed with their packaging and shipping. 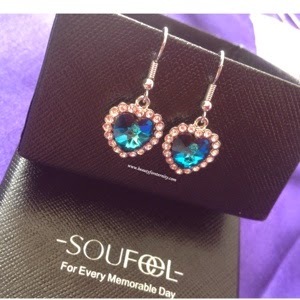 Soufeel.com have exciting offers going on most of the time. Therefore I picked up some necklaces too. The one shown in the picture above is a gorgeous gold plated necklace which has a long chain that reaches slightly above the navel and a gorgeous extra ordinary pendant with a huge greenish-greyish crystal. The pendant is quite unique because it has a mesh like intricate work done on the upper part of it. The upper sieve like part has floral design with small white crystals studded here and there and slides freely on the large coloured crystal. The chain can be doubled up as well as worn singly. You can use this chain with other pendants also. The chain has a secure spring lock and extra hooks to alter the length. 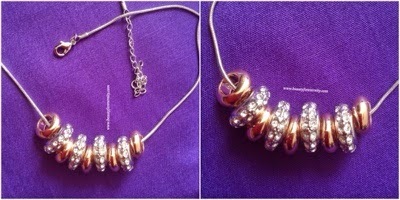 I am totally in love with this pendant set because it looks lovely with my western dresses. 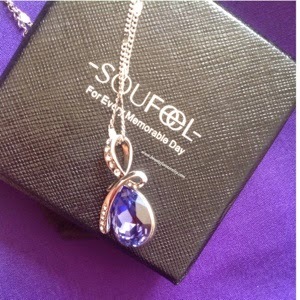 This beautiful purplish pendant from soufeel.com, in the picture above was another girly piece of jewellery that caught my attention. It looks like an asymmetrical bow with clear stones studded in and a drop shaped amethyst crystal hanging down. It is appropriate to be worn at work, a casual day out, a romantic date or anytime when you feel like. The colour of the crystal as well as it's design complements a wide array of attires. It comes with a gorgeous chain which reaches slightly above my neckline. 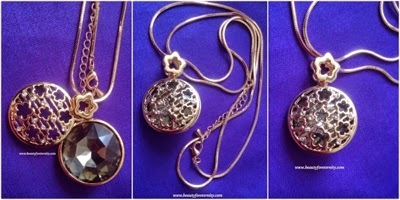 The pendant and the chain can be worn separately also because you can take out the pendant easily out of the chain. Just like gold plated necklace, this one also has a secure lock and extra hooks for adjustments in the length. After buying necklaces in golden and silver, I really wanted to buy something in copper shade also so as soon as saw the above necklace, I added it into my cart. 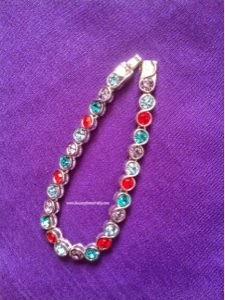 It is a round chain which has 5 copper coloured plain rings alternating with 4 silver coloured studded rings. Just like all other jewellery pieces, this one also is very unique in itself. It goes so well with my dresses. The chain stays above my neckline and has a secure lock and extra hooks for length adjustments. 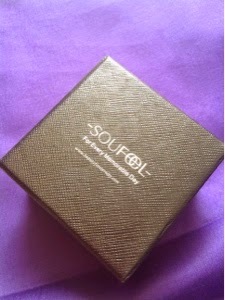 I am 100% satisfied with the product quality, designing and service of soufeel.com. I get a lot of compliments when I wear this jewellery. All the jewellery items are made up of sterling silver and of high quality and durable. I will buy again and again from soufeel.com and highly recommend you all to check them out.